Calcutta Cooler Review – Can These Ice Chests Keep their Cool? Today, we are giving you a Calcutta Cooler review. With all the cooler options out there, we are doing our best to bring you the info you need to find the most epic coolers available. Calcutta starts things off right by flying the Jolly Roger as their logo, we love the moxie. For 25 years Calcutta has been designing and selling gear for folk like you who can’t enough of the outdoors. The philosophy of Calcutta is built around helping, “you reclaim your free time and to declare mutiny on the mundane” (calcuttaoutdoors.com) by making awesome equipment and apparel to enable you to get out more often and for longer. 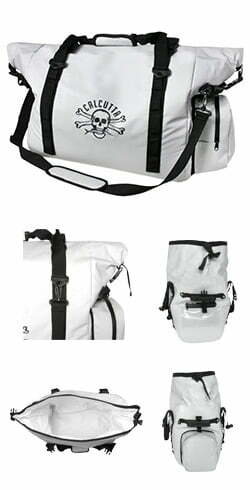 So, it makes sense that Jolly Roger waving company would look to makes coolers that are built to give a long-lasting adventure. 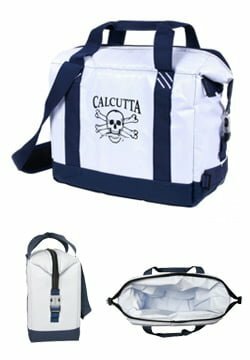 Calcutta has designed a series of hard and soft coolers to let you take all your booty with you on all your voyages. 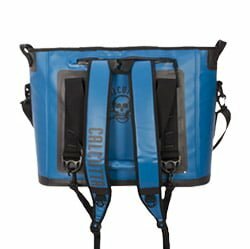 Calcutta has 4 separate cooler lines; the Performance Series for keeping treasures cool for a long time, the Renegade made for exceptional performance and mobility, the Keeper lightweight option for keeping your colds frosty, and the Pack series that’s easy to fill and go for a day on the lake. To kick off the Calcutta Coolers line up, we have the Premium series of heavy duty coolers that are designed from the roto-molded out to keep your chillys down right cold for longer than the standard cooler. The Calcutta Premium doesn’t bring anything new to the cooler table, but sometimes it is more about doing something well instead of trying to reinvent the wheel. The Premium series is roto-molded to provide an all but indestructible body capable a withstanding a great deal of punishment. 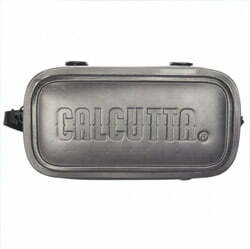 Calcutta has added 2-inches of insulation to the body to help keep your beer and beef cold for several days. Or, keep your freshly captured catch o’ the day fresh until you get home to impress your friends. We won’t tell them you bought it at the store on your way home. The entire cooler sits up on raised non-slip feet that are a nice touch to make sure your wild driving doesn’t send the cooler sliding all over the truck. Again, nothing new, and nothing like the magnetic Magna cooler, but an essential feature for making sure your goods stay good during travel. The lid of the Premium class is designed to function like the chest freezer in your garage that seals firmly to the body of the cooler. The lid is complete with a rubber seat the compresses to make a better seal. Two heavy duty rubber latches complete the seal by firmly compressing the lid down and making sure the chill doesn’t have a chance to escape. If you’re a little paranoid about someone stealing your beer, or your fish escaping, the Calcutta coolers have grommets to lock up your good from any mutinous intruders. The topside of the lid is no less impressive thanks to the traction texture that helps keep your drink and steak in place when you use the cooler as a table. The lid also has a built-in ruler to measure your catch. Now, the Performance Series comes in 4 sizes (30L, 50L, 80L, 120L) so you need to make sure you have the right cooler along for the fish you will be catching. For example, the 30L is only 24-inches long, so you won’t be able to measure, or store that size fish. Alternatively, the 80L is 30-inches long, which is perfect for going after larger in-shore or deep-sea fish. Tip: For more recommended marine coolers read this post. Just like your Blu-Ray collection, we can leave out the bonus features of the Calcutta Coolers Performance line. Each of the different sized coolers comes with a dry food storage tray that makes sure your dries don’t get soggy along the journey. The tray is designed to sit on a lip inside the cooler to maintain the seal, but also prevent liquids from sneaking their way up into the tray. If you get rowdy and flip the cooler around liquid may get in. The 80L cooler also comes with a divider, cutting board. At the bottom of the cooler’s side is an oversized drain plug to remove any of the melted ice, or other fluids from fish or spilled drinks. This is another typical feature, but very nice to have when it comes to clean up after the trip. 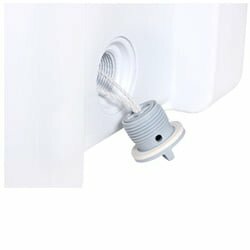 The plug is threaded to prevent accidental dislodging and maintain the cool seal. The drain is also secured to the cooler to prevent losing it while you are draining. 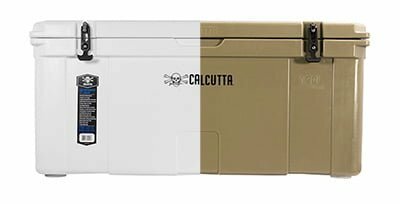 The Calcutta Performance Series Coolers come in two colors. Pure snow white, and army camo tan. The white lets you collect the marks and scars of your adventures, while tan make you look army tough. So, Yeti has become then name to be measured against in the high-end cooler world. 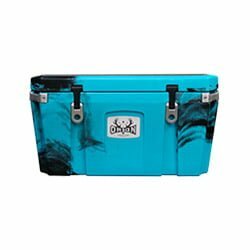 Even though Calcutta has been around for a while, Yeti is much more well known for their quality coolers. 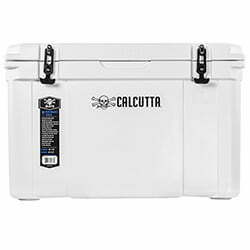 The impressive lifetime of Calcutta has helped them know how to bring a new product into a heated market, so the Performance line of coolers actually stands up well to its Yeti counterparts. The build quality alone is a close match to the nearly bomb proof (do not test) Yetis. One of the major advantages of going with a Yeti is the presence of comfortable and easy to use carry handles on the smaller sized coolers. The Calcutta Coolers don’t get a handle until you get up to the 120L size. 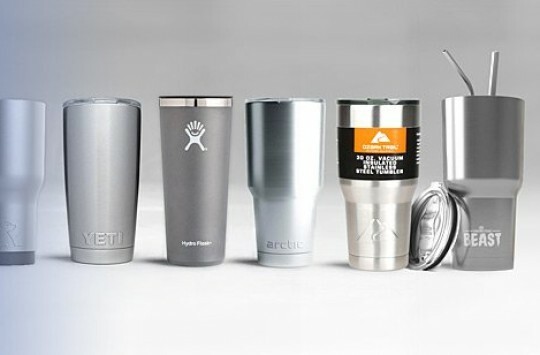 The other distinct advantage of the Yeti is the wider range of sizes. Calcutta has 4 available sizes ranging from 30 to 120 liters. Yeti’s Tundra offer sizes starting at 20 quarts and going all the way up to 350 quarts with sizes available at almost every 5-quart interval. Yeti also has different shapes available (like rounded Tank option), which is a nice feature for packing into differently shaped spaces. 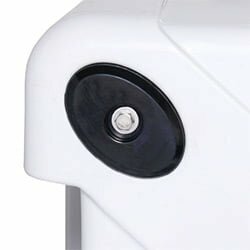 Where Calcutta pulls even in the Calcutta vs. Yeti comparison is in the build quality and cold power. 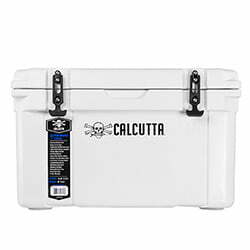 Calcutta uses the same roto-molding technique as the Yeti coolers, that produce a highly resilient body that won’t break down when you use it as a stool. 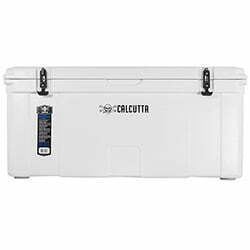 We have seen reports that the Calcutta ice chest can keep ice for up to 6 days, which is comparable to the Yeti’s 5-7 days ice retention. Where the Calcutta tops the Yeti is in weight. On average, the Calcutta is 2-5 pounds lighter than the same sized Yeti. 2-5 pounds may not sound like a lot, but when you figure you’re going to be hauling more than 30 pounds of food and drink in these puppies, those extra pounds add up. Calcutta offers three models of soft coolers that are a great alternative to the heavy-duty ice chest Performance Series model. The soft cooler offers more portability and can often fit into tightly packed cars where space can is a premium. When we first saw the Renegade cooler, we were a little shocked by the price, but when the features started to roll out we began to understand. The first thing that caught out attention was the YKK Aquaseal waterproof zipper. A lot of soft cooler claim to be leak-proof, or spill proof. 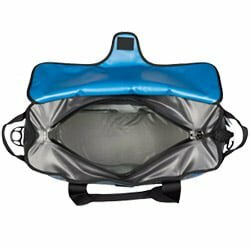 What they don’t tell you is that if any liquids gather around the zipper your leakproof cooler becomes a molded interpretation of the Great Lakes tributaries, with water coming from every direction. 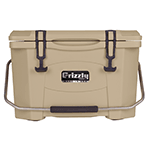 The Renegade has a truly water-proof zipper and reinforced seals and welds that make this cooler truly leak proof. Now that great thing about being leak proof is that it also means that the cool air is much less likely to escape, keeping your goods colder, longer. In fact, that was the Calcutta’s goal when they designed the Renegade. The Renegade can’t keep things as cold as long as the Performance Series, but you don’t have to worry about rushing around to keep the hot dogs and drinks cold. 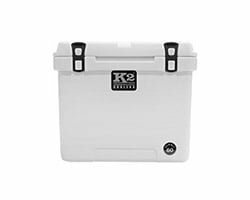 The second part of the keep cool system that the Renegade employs is closed cell foam insulation that slows the transfer of heat from outside the cooler to inside. As a 30L cooler, the Renegade has enough storage to hold everything you need for a day out on the lake, at the beach, or taking a hike up to a romantic picnic spot. At less than 9 pounds (empty) this is a better option than a 30-pound hard cooler. 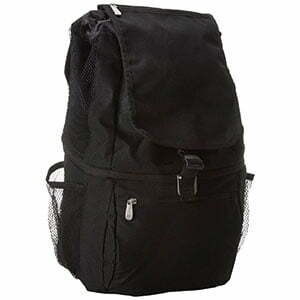 Plus, Calcutta built-in backpack straps to make transportation much easier. Even though the Keeper looks more at home holding a bowling bag, the features and performance of the Calcutta Keeper soft cooler make this a cooler worth looking at. Calcutta followed the same high engineering standards they employed with the Performance and Renegade models. Welded internal seams make sure that no liquids will slip out of any seams or weak points in the body of the cooler. Instead of just relying on a zipper like other brands, Calcutta made the Keeper with a roll-top closure that helps reduce the transfer of air when the cooler is closed. When rolled closed, the top is held in position by plastic clips and nylon straps that you can tighten down to make sure your roll stays tight. The result of a properly fastened roll-top is a system that can keep up for more than 24-hours. On the side of the Keeper is a clear zippered pocket that is capable of not only displaying a smart phone but is the right thickness to allow you to use your phone’s touchscreen to silence those annoying work calls while you are enjoying a day out on the water. 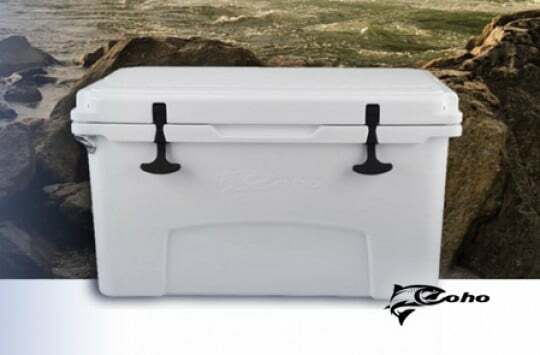 The Keeper is a 35L soft cooler that will hold enough ice and drinks to keep your entire crew thirst free for an entire day of fishing. 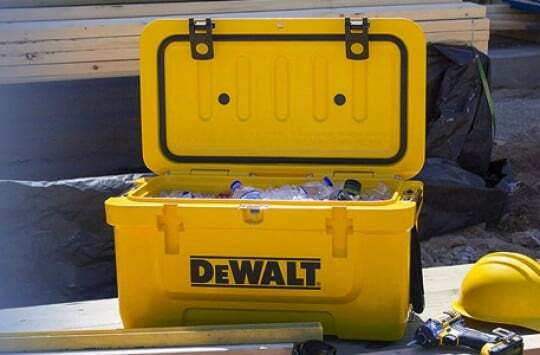 The cooler itself is only 5-pounds, but when filled it can get weighty. Thanks to the shoulder and hand straps, the cooler is still easy to move around when filled with party time goods. If Calcutta had an entry-level cooler the Pack series would be it, though entry-level hardly is adequate to describe the Pack Series. 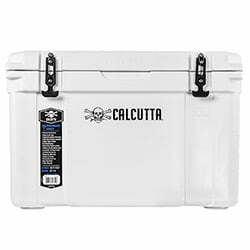 This is the smallest of the Calcutta Coolers, but it follows the same high-quality construction standards that have made Calcutta worth taking a serious look at. 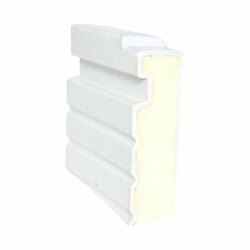 The inner liner of the Pack series is welded and reinforced at the seams to prevent leaks and liquid loss, that always seems to happen at the worst possible time. 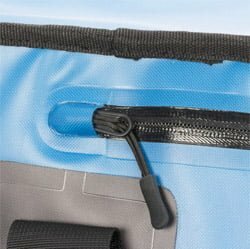 The zippers are taped sealed to prevent some moisture loss, but more importantly they prevent air from transferring between the cracks in the zipper, and makes the Pack Series more efficient in storing all the most important cold treats you take out. The inside liner also is designed to be “sweatproof”, which is a gross, but fancy way of saying that as the temperature increases in the cooler moisture doesn’t develop and cause things to melt faster. The Pack series has two size options. The smaller is large enough to tote the equivalent of a 12-pack of 12 ounces. This makes the smaller pack a great option for quick outings, like a guys’ night poker game and BBQ, or a ladies’ day doing fun girl stuff. The Second size can hold a 24-pack, and is a much better option than a frilly picnic basket for surprising the love of your life with dinner underneath the stars. The skull and cross bone on the side lets you hold on to your man card while you sip and nibble the night away. Where to buy Calcutta Coolers is completely up to you. You can buy direct from Calcutta where the free shipping starts from $50, or you can order via Amazon (here’s a link). If you want to make sure that you get a good deal, low cost or free shipping, combined with the best support in case something goes wrong, we recommend sticking to Amazon. There is a reason Amazon is the top online retailer. They offer great prices, and every purchase is backed up 100%. Even if you aren’t an Amazon Prime member, they often offer awesome shipping rates, including free when you meet certain order qualifications. We’re pretty sure Calcutta ice chests should qualify but it’s best to check by yourself here. 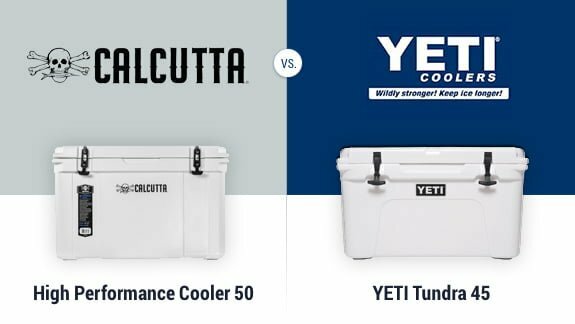 So, the bottom line of our Calcutta Cooler review is that Calcutta offers great coolers, at a lower price than some of the elite names like Yeti. You may not have all the sizing and shape options, but you can bet you will get a great cooler that will withstand all the abuse you can throw at it. 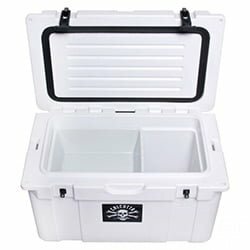 Both the Calcutta ice chests and the soft coolers do a wonderful job of keeping everything nice and frosty for much longer than you will likely be out using them.